The new kids on the block. Who were they? Where did they come from? During the second millennium BC (between 2000 and 1000 BC) groups of animal-herders had moved down from the steppes of central Asia, and established themselves on the Iranian plateau. They became the Medes and the Persians. But plenty of Iranian peoples stayed on the steppes - becoming expert horsemen, and perfecting a nomadic lifestyle. The Greeks ignorantly referred to all these peoples as "Scythians" - there were many different nations, but they all spoke Iranian languages related to Persian. During the Seleucid period, around 250 BC, another movement began. One of the nomadic horse-riding nations began filtering down into the area east of the Caspian Sea, in seach of more arable land. These were the Parni or Aparni, a branch of the semi-nomadic Dahae people. 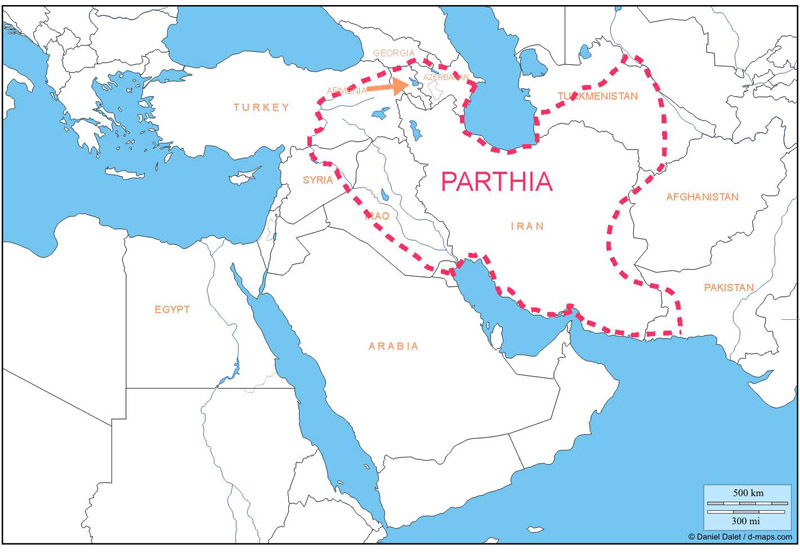 Deterred from taking on the powerful Bactrian kingdom, they infiltrated the satrapy known to the Greeks as Parthia, and so became known as Parthians. In 247 BC unrest in Bactria further east inspired the Seleucid satrap of Parthia, Andragoras, to break free of the central government. This gave the Parthians themselves the idea of breaking free from Andragoras. A group of seven conspirators murdered Andragoras, and proclaimed one of their number, Arshak (Arsaces), as king of Parthia. Holy fire, kept burning for ever, was used at his coronation: the religion of Ahura Mazda perhaps symbolised his intention to revive past glories. Unlike in Bactria, this was a "nationalist" uprising: an Iranian people taking power for themselves. He quickly extinguished Greek rule in Parthia. The reconquest had begun. Arscaces ruled until about 217 BC, when his son Arsaces II succeeded (c217 - c191 BC). Arsaces became as memorable among the Parthians as Cyrus among the Persians, Alexander among the Greeks or Romulus among the Romans. After a long period of peace with the Seleucids, their progress was challenged by Antiochus III in 209 BC, but his defeat by the Romans at Thermopylae (again) in 191 BC ended his briefly successful attempt to revive Seleucid dominance. In any case Antiochus had de facto recognised the Parthian state. 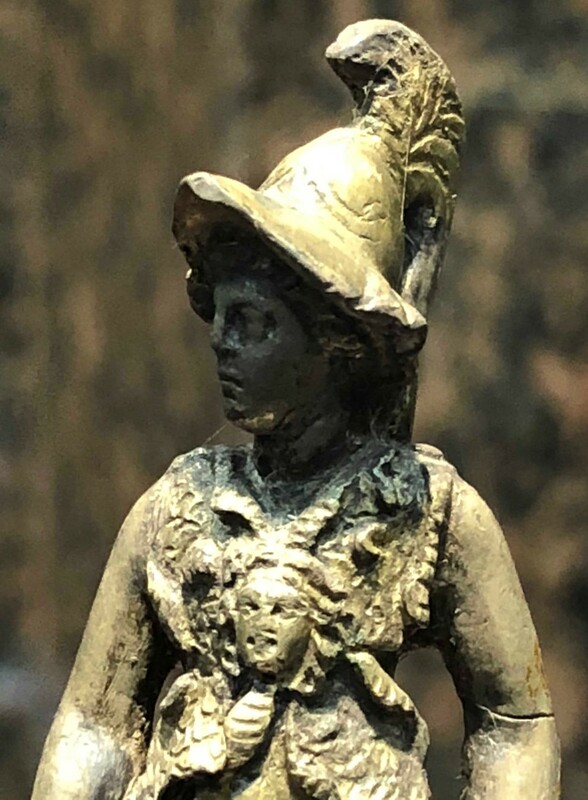 A statuette of Athena found in the ruins of Nisa, Turkmenistan. Nisa is believed to have been the first Parthian capital, though evidence for this is lacking. Mehrdad I (Mithridates I), who ruled from ?171 to 138 BC, was the most distinguished of the Parthian kings, transforming Parthia into a large and powerful empire.. He first did a deal with independent Bactria, securing his rear. He then turned west. He took Ecbatana in 147 BC. Advancing into Mesopotamia, he took Babylon in 141 BC and finally the Seleucid capital - Seleuceia - in 139 BC. It was simple to mop up Media, but Elymais and Characene on the Persian Gulf, though, were difficult, and Parthian rule over them was short-lived. He's referred to as "King of Kings" in a Babylonian document. But he still called himself "Greek-lover" on his coins (and so did his successors) - no doubt to reassure the many Greeks in the cities who were now his subjects. During the reign of Farhad II (Phraates II, 138 - 127 BC) the Seleucids undder Antiochus VII had one last try at beating back the Parthians. Temporary success was totally wiped out by Farhad II's victory at the Battle of Ecbatana (129 BC). The Seleucid army was annihilated, marking the end of their 150 year rule in Persia. Many of these Greeks were taken prisoner, and recruited into the Parthian army. But he couldn't take Syria and finish the Seleucids off, because of events in the east. The Yuezhi, an Iranian tribe living in Mongolia, were under pressure, because of the expansion of a mysterious people called the Xiongnu. They threatened the Yuezhi, the Yuezhi threatened the Saka, and the Saka threatened Parthia. Farhad II' s brilliant idea of using the Saka to fight the Seleucids misfired - feeling they'd not been rewarded for their service, they went on a spree of destruction through the new Parthian domains. Meanwhile other Saka overwhelmed the Bactrian kingdom. Farhad II took them on, but lost, and was killed. The newly-enrolled Greek hoplites had preferred to join the Saka; unsurprisingly the Parthians decided they could fight better without Greeks in future. The next Arsacid, Ardvan I (Artabanus, 127 - 124 BC) spent his reign fighting the Saka, and was also killed in battle. Mehrdad II (a long and important reign 123 - 88 BC). In Mehrdad II (Mithridates II) the Arsacids produced a great leader. First he had to deal with Hyspaosines of Characene, who had overrun Mesopotamia, and occupied Seleucia 121 BC) Then he neutralised the Saka problem by giving them somewhere to settle, out of the way in south-east Iran: modern Seistan (=Saka-stan), which had been recovered from the now defunct Indian Maurya empire. After consolidating Parthian control of their earlier winnings, Mehrdad II was crowned King of Kings (109 BC)- and now felt himself the true successor to the Achaemenids. The Parthians had an empire of their own. Mehrdad even felt entitled to record his achievements, like Darius the Great, on a rock-face at Bisitun, just below the original. Persian became the official language instead of Greek, and the old Zoroastrian religion began a revival. The Parthian centre began a move westward again, into Mesopotamia - the Euphrates became the western frontier, and a new capital city was built at Ctesiphon, on the opposite bank of the Tigris to Seleuceia. Armenia (never properly part of the Seleucid empire) had become Parthian by 95 BC, as had the northern Mesopotamian territories of Adiabene, Gordyene and Osrhoene. Mehrdad welcomed Zhang Qian (Chiang-k'ien), ambassador from the Han emperor Wu (aka Han Wudi), who ruled from 141 to 87 BC. Zhang Qian opened up the caravan route between China and the west which is now known as the "Silk Road". The most important 1500 mile stretch through central Asia was controlled by the Sogdians, an Iranian people with their capital at Maracanda (Samarkhand). Mehrdad's capture of Dura Europus, a major Seleucid city in Syria had an ominous consequence. A first meeting took place between the future deadly enemies. Present were the Parthian representative Orobazes and the Roman governor of Cilicia (around 92 BC) - Lucius Cornelius Sulla. Both perhaps had a common interest then in fears (justified) about the intentions of Mithridates VI of Pontus. Initial contact was friendly and non-confrontational. A treaty was concluded, possibly recognising the Euphrates as a common frontier. With contacts established with both Rome and China, the Parthian empire was now a force to be reckoned with. They controlled and profited hugely from the new trade route between east and west. Like the Persians themselves under Cyrus over 300 years previously, a little-regarded Iranian people emerge from obscurity to build an empire. Very limited and hard to make sense of. Evidence comes largely from coins, and a few passing references in Greek and Roman writers (Polybius, Strabo, Pliny the Elder, Justin's epitome of Pompeius Trogus - muddly, but the best we have). Sometimes these quote earlier writing, such as the Parthica of Apollodorus of Artemita (c130-87BC), who lived through some of the events, but not a single fragment survives. They probably did keep records, which were destroyed by the Sasanians. Chinese records, (where Parthia is called Anxi) are also important. A confederation of tribes belonging to a branch of the Saca/Scythians based in Turkmenistan - they were counted by the Achaemenids as part of their empire, and provided troops for Darius III and Alexander. That's what the Greeks called them. We don't actually know what they called themselves. They are sometimes called "Arsacids" by modern historians - after their founder: it fits then with Achaemenids and Sasanids, also named after their founders. Fire was always a special element to the followers of Ahura Mazda. Each king had his own personal fire (which could accompany him on his travels in a portable altar). This tradition persisted right through the Sasanian period as well. This became Year 1 of the Parthian calendar, which they used on their coins - whose inscriptions were in Greek. Many of the Parthian kings called themselves "philhellen" - lover of the Greeks. This must have been reassuring for their numerous Greek subjects, while presumably they appreciated the wealth which came to them through Greek traders. Remind you of anything? It seems rather too much of a coincidence. And probably is. The later Arsacids were undoubtedly keen to promote their foundation myths. Out of respect for the "founder" of Parthia, Arsaces became a sort of title - his successors all called themselves Arsaces. There are thus known as the Arsacids. But it has made it difficult to be sure which king is which. was Justin, date unknown, who wrote a condensed version of Pompeius Trogus' history of the world. Trogus' massive work is lost. He was a Gaul who wrote in the reign of Augustus (around 10 BC). 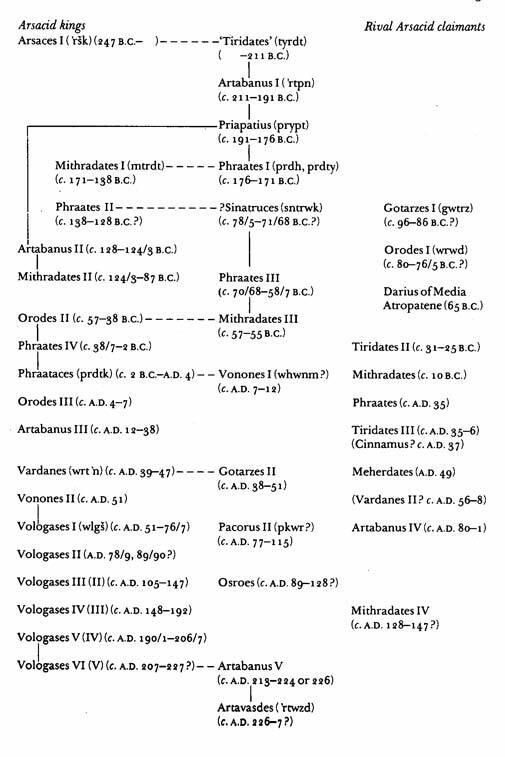 It's an important source for the early history of the Parthians. They created an empire from Siberia to Mongolia, from Kazakhstan to China. They were perhaps the people who became known as "Huns" when they (much later) invaded Iran and Europe, although there are numerous competing theories about them. They were currently facing conflict with the Han Chinese empire; in 215 BC the preceding Qin dynasty had started building a wall to keep them out of China (part of what became known later in the west as "The Great Wall of China"). Contemporary Chinese historians describe them as eating raw meat and drinking blood. So frightened of them were the Chinese that they had been prepared to pay huge sums (much in silk) to keep them at bay. More here. The Greco-Bactrian kingdom had scarcely recovered from the Saka when the Yuezhi arrived, ending the 200 year existence of this island of Greek culture in the east. 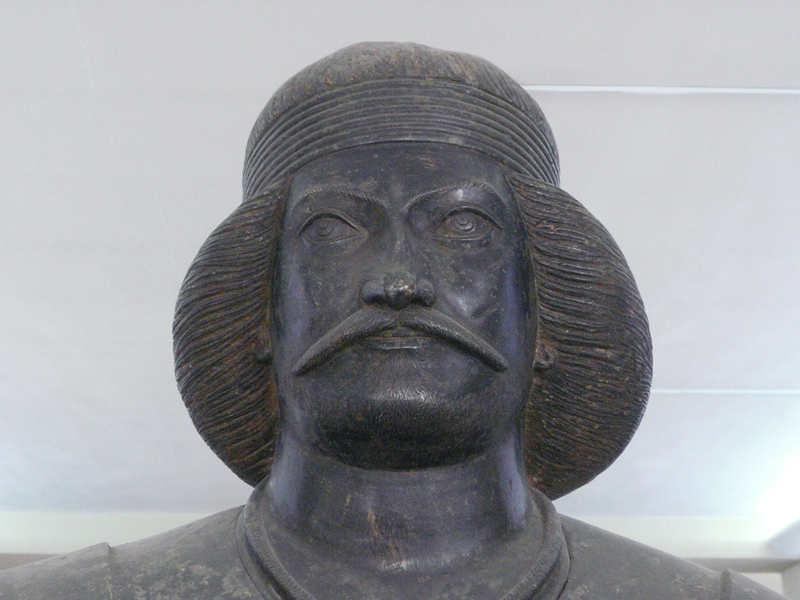 Before this happened, the Bactrian king Demetrius had established an Indo-Greek kingdom in Pakistan (about 180 BC). This remote outpost of Greekness hung on until the beginning of the 1st century AD. Its most famous ruler was Menander I (?165 - 130 BC), whose silver coins say, in Greek, "King Menander the Saviour". As well as being a leading figure in the spread of Buddhism, he fulfilled Alexander's dream of extending his empire across India as far as the Ganges. See more on Bactria and India in the Neighbours section. 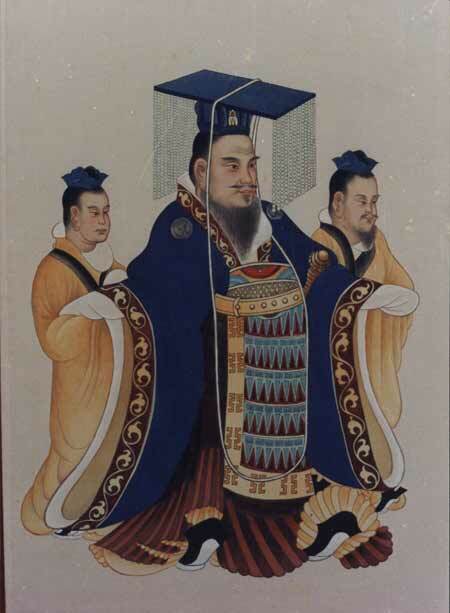 One of the great Han emperors, responsible for doubling the size of the Han empire, and establishing Confucianism as the dominant religion in China. His territory became larger than the Persian empire. A highly successful Roman general and politician. He was later responsible for the final defeat of Mithridates VI of Pontus (not to be confused with our unrelated Parthian, who was Mithridates II.). He was the first general to anticipate Mussolini by marching on Rome (twice), and becoming dictator. As dictator his actions were ultra-conservative, as he tried to suppress the people's participation in the government of the Roman republic.